Trump's Merch Store Launches $99 Anti-NFL Jerseys - Joe.My.God. 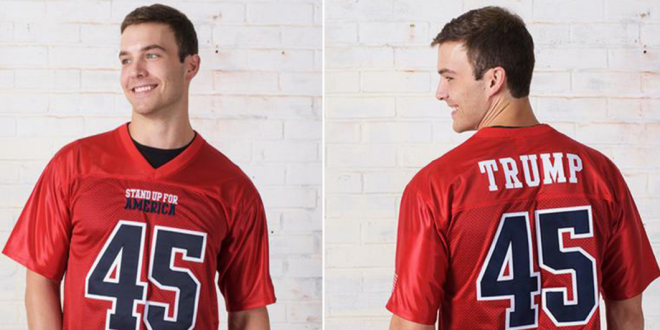 A online merchandise store ran by President Trump’s Make America Great Again Committee is now selling “’Stand Up For America” football jerseys in response to NFL players kneeling during the national anthem as a protest to racial injustices. The jerseys are selling for $99 each and come in both male and female sizes. They are being sold on a site authorized by and composed of Donald J. Trump for President, Inc. and the Republican National Committee. The jerseys also feature Trump’s last name on the back in addition to the number 45.